Time for another snapshot – this time looking at Eurostar 9114 from London St Pancras to Amsterdam Centraal. As this features international train as opposed to plane, it’s a little different from the usual snapshots I run. I arrived at St Pancras International with just over an hour to go before departure. After grabbing snacks, I headed through the automated boarding pass check. From there, you clear security (and yes, you can bring liquids and gels over 100ml through here), the UK Border and the French border at once. Once through, you’re in a waiting area. Departure was delayed for 40 minutes due to a fault in Car 7 of the train – the lights weren’t working (and the train went out with the carriage). It’s a Eurostar e320 – or for those with a train spotting inclination, a Siemens Velaro Class 374. A 16 car train made up of 6 Premier coaches, 8 standard coaches and two catering cars. I assigned seat 03 in car 13. This is a window seat. If you can spot the window, you’re doing well. Recline on the seat was interesting, with the seat using the sliding forward. Seat is pitched at 34″ Seat width with a 18″ width (akin to many premium economy/Eurobusiness seats). Power at seat is available in both UK and EU standard plugs. The route would take us from St Pancras, down High Speed 1, into the Channel Tunnel, onto the LGV Nord to Lille (without stopping), onto HSL1 to Brussels Midi, a jaunt through the semi-high speed lines of Belgium, before accelerating onto HSL4 for Rotterdam and finally Amsterdam Centraal. 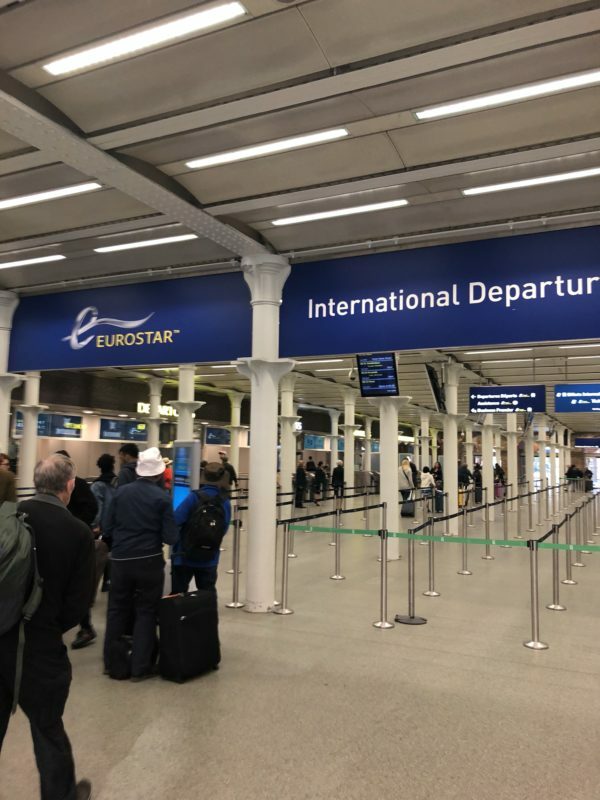 Streaming Entertainment was offered on the service., delivered via the Eurostar App for content that had Digital Rights Management on it. Overhead screens showed some information… when they were activated. The train offered in on-board Wi-Fi, which works off 3G/4G communications. As such, the speeds were rather slow.